Director's Commentary: Nothing to report, save to say, yes, that is a reference to O Brother, Where Art Thou? Director's Commentary: I pulled one of those "fast forward" narrative moments, to reveal that Josh had lived through the debacle I cliff-hung the last episode with, leaving Caleb's fate unstated. I don't think my motivation was being clever though: I was just sick of drawing the crowd, Igal, Moses, etc. I was itching to do something different, and was playing around with photo references, which I used to draw the first four and final panels. I used a photo background run through Photoshop filters for the final panel. I clearly went back to my burn and dodge approach, but it's more understated here. I think there was a month or two in between the last episode and this one, but I can't recall. What I remember is actually scripting this episode, then thumbnailing it, before finally drawing it rigorously at my drawing table, unlike the whole series to date, which had been drawn quickly on coffee breaks and stolen moments throughout the day. I hate that I called the chapter "Azra'il," which is the transliterated name of the angel of death in Arabic, since I'd later be referencing the Shekinah. It really should have been called Shekinah. Director's Commentary: I don't have many good things to say about this page. It was clearly a rush job, both at the level of initial line art, and in the coloring. 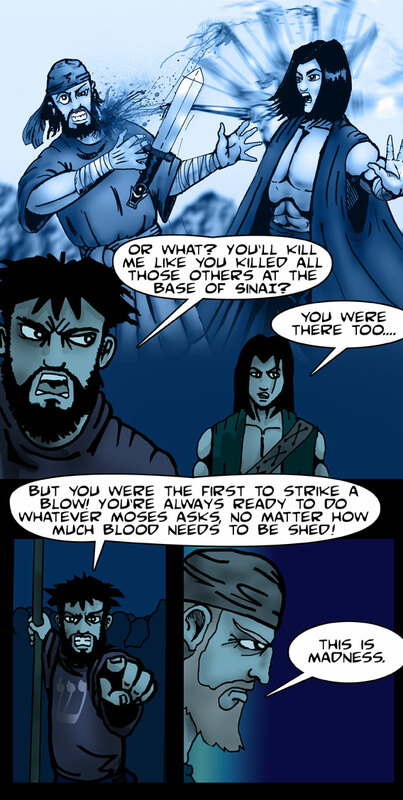 I like the first panel and the mob, but I'd definitely re-color Igal and re-draw the last panel (aside from Josh talking out the side of his mouth). Director's Commentary: I think I should start calling this "midrash," the Jewish practice of reading between the lines of a sacred text. 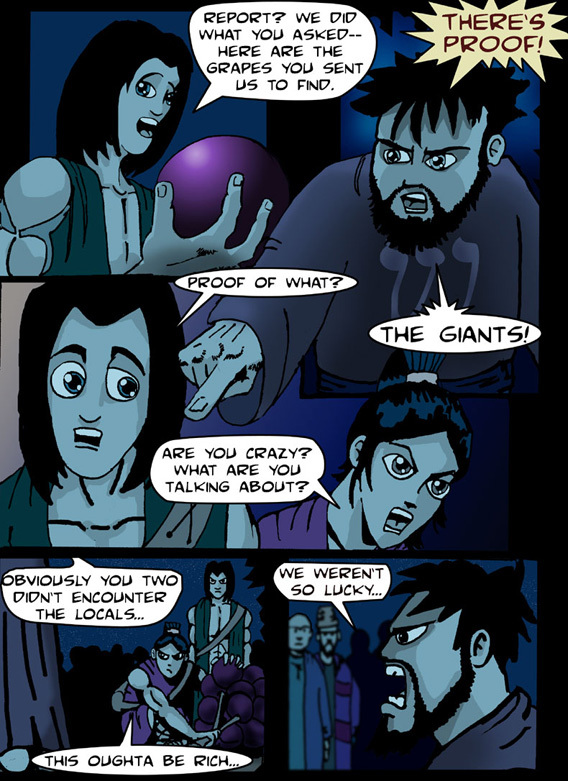 Or maybe that's what I'd call the whole series of this web-comic plus the Ezekiel comic Nathan Thomas and I did together, since neither is totally faithful to the original text. 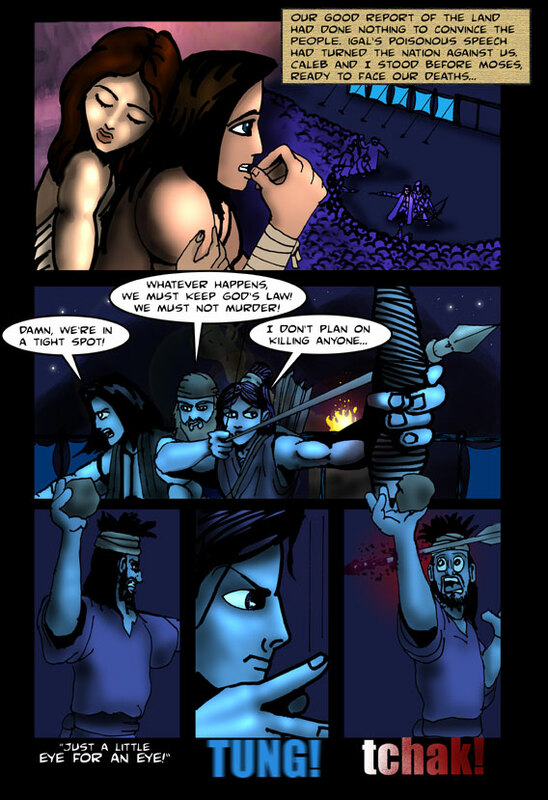 I really like this page - it definitely raises the issues that started running around in my head as I was reading the Biblical passages associated with this narrative. "Everyone's been partying with a golden calf! Joshua, pick up your sword and kill everyone who was doing it and isn't sorry!" And Joshua obeyed. I'm pretty sure he had to kill some friends that day. One of the things I'd definitely change if I had the chance would be to give Josh a beard. 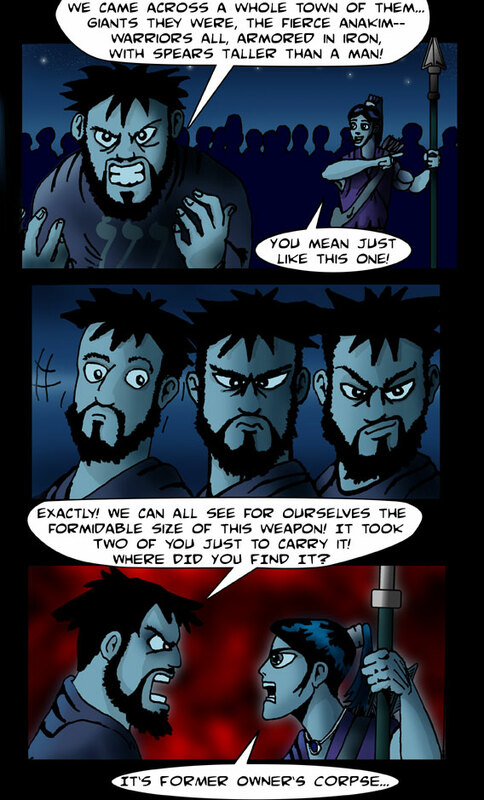 I don't like that I've unilaterally drawn the "bad" guys with beards. Not a good policy when you're drawing a story taking place in the middle east, even if you're only viewing it as a mythic space. At the time, my thinking was to offset Josh and Caleb as being young men, even though they were in their 40s, according to the text. 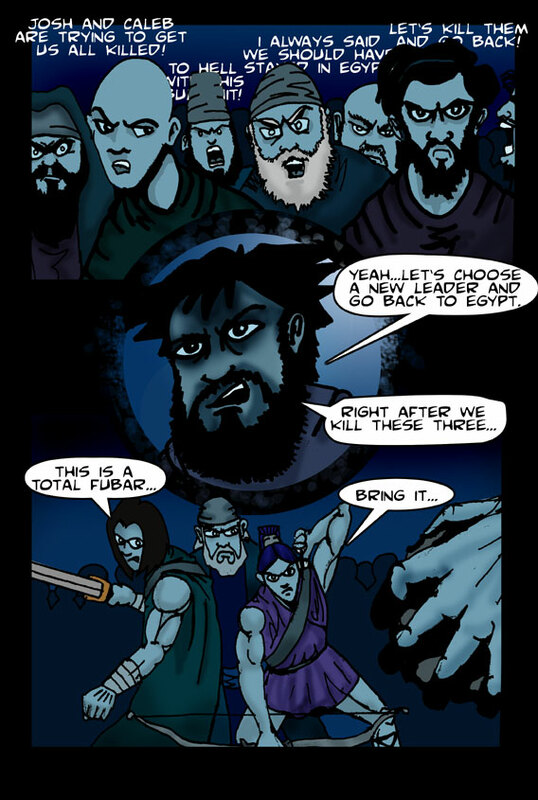 The flashback image was drawn independently of the actual paneled art, and then combined in Photoshop when I colored it. There's a full-color image of it I'll post in the "DVD extras" when the series wraps up. 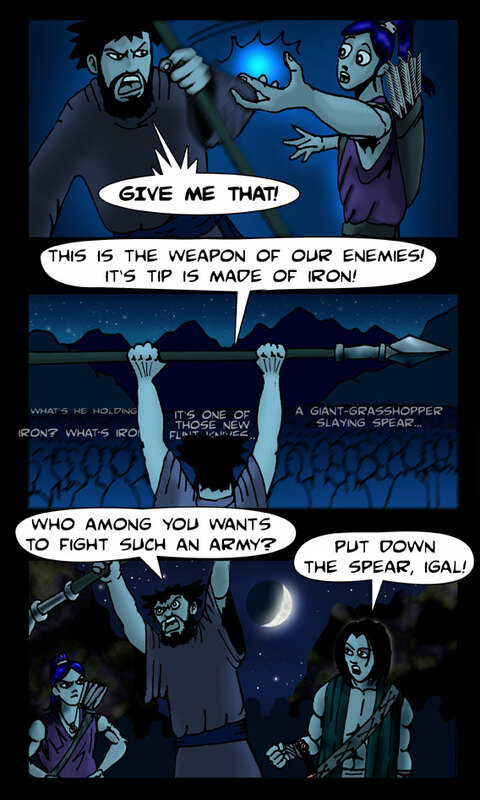 Director's Commentary: Mostly just little things here - I love the stars above Igal, and the unfocused background crowd behind Caleb in the fourth panel. I'm sure a scholar of comics could say more about my composition, but I feel like it's pretty good for just going on pure instinct and years of reading comics. Aside from the sudden disappearance of Igal's name brand logo, I love it. 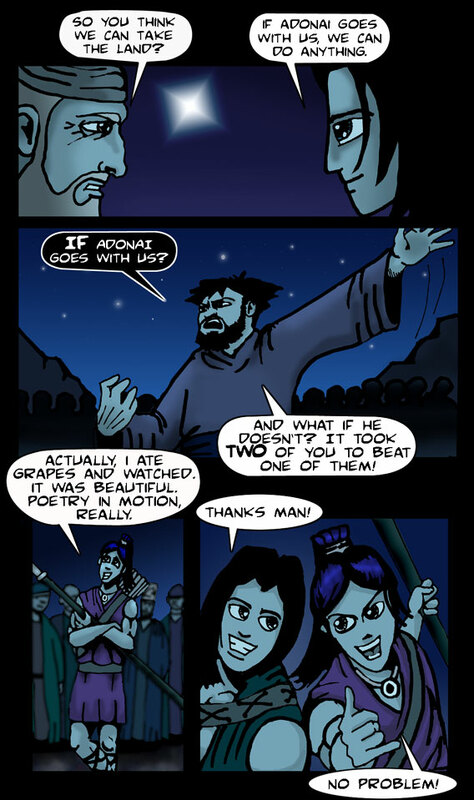 Director's Commentary: My villain, Igal, is the ultimate opportunist: first, he uses the grapes as proof of the giants - obviously, a land with giant grapes must produce giant people. 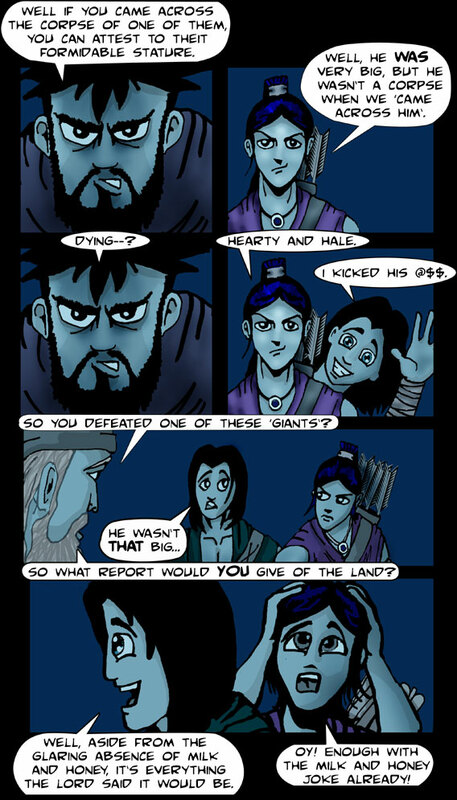 Then, when Josh and Caleb produce the spear, it's further proof - a spear that big could only be thrown properly by a giant. He's unstoppable. Unfortunately, I neglected include why he's relentlessly dissuading his nation to stay out of the Promised Land. I include that in the "deleted scenes" from Chapter 2.